A chicken can lay more than 200 eggs per year. An average milk cow can produce six to seven gallons of milk a day. You know farm animals can help increase income for families, but they can also do so much more. 1. They get kids ready for the classroom. 13-year-old Erwin is a full-blown entrepreneur now, thanks to generosity from friends like you. 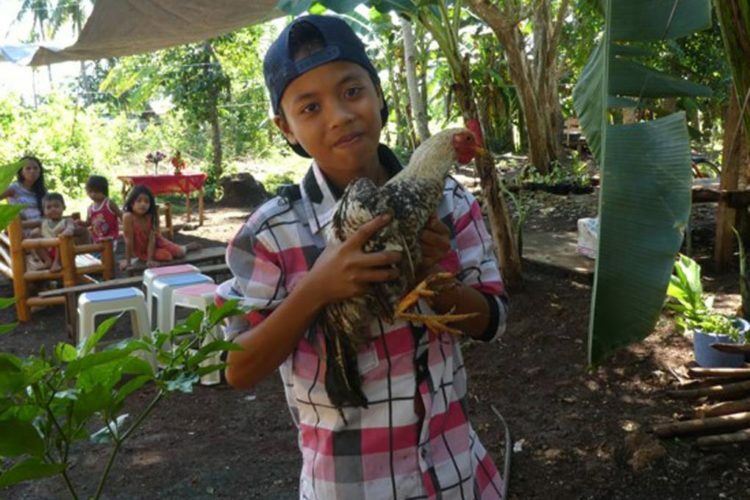 BGR helped him start a poultry business, and now, he can pay for school supplies and school exams. And you know what’s even better? He can continue the business and pay for other needs later! Your gift will keep on giving. 2. They help the lonely make new friends. Elderly widows often need food, heat, and shelter. But, they especially need company. You helped provide for Mineta’s physical needs when you bought her a cow from the BGR Gift Catalog. With it, she could sell milk and cheese for income. But, you also gave her a way to build relationships. Christian workers spent time with her, training her to care for the cow. Then, they started bringing volunteers by her home, and Mineta loved serving them coffee and snacks. She felt grateful for the cow but she found joy in contact with other people. Thank you for giving such a beautiful gift to a lonely woman! 3. They turn parents into better caregivers. Remember that pair of rabbits you bought from the BGR Gift Catalog? They helped turn Gerardo into a better husband and father. He had been a drunkard and a gambler, and his family suffered for it. But then, he started raising rabbits with his wife. BGR soon helped the family start farming pigs, as well. With profits from the animals’ offspring, the couple could purchase school supplies for their children, along with a carabao and a cow. As his farm grew, Gerardo followed the example set by Christian workers and abandoned alcohol and gambling. He has become a new man and a better father! 4. They help make a house a home. Ulap sits in a new chair while her new fan chases away the sweltering heat. Her small home now has furniture and appliances because someone like you chose a pig from the BGR Gift Catalog. Just one pig helped her make her house a home. She learned how to raise a piglet through a BGR program, and your generosity gave her an animal to rear. When it gave birth, she sold the offspring and bought household items. 5. They allow pastors to support their families and ministries. Following God isn’t always easy—especially when it costs you financially. Manas obeyed the Lord’s call to preach in a certain village. But, he had trouble making ends meet there. Gifts from friends like you helped train him to raise odorless pigs, and you helped improve his piggery. You helped Manas feed his family so he could continue spreading Christ’s love. Pray for this pastor as he works in his village and as he becomes an illustration of God’s blessings. Flip through the BGR Gift Catalog today and donate a new animal to a vulnerable family. God will use your generosity to transform lives in ways you never imagined.